Ten days before Christmas, on Dec. 15, 1970, after 25 years of discussion, planning and construction, Toledo cut the ribbon on a $65 million present: an 8.8-mile stretch of Interstate 75 and 475 then known as the West Toledo Expressway (“as it has been called since its inception,” The Blade wrote in an editorial, though I don’t ever remember hearing it called that). Highlighted in blue, the segment of Interstate 75/475 that opened Dec. 15, 1970 (1969 map source: Ohio Department of Transportation). The 10 a.m. ribbon cutting took place on the west end of the highway in Sylvania, near the U.S. 23 interchange, after a breakfast. Despite the festivities, not everyone was happy. Especially Sylvania. “Sylvania and Toledo officials, while acknowledging completion of the 8.8-mile Interstate 75-475 segment, admonished planning engineers and politicians to go back to the drawing boards in developing better accesses at both ends of the freeway section,” The Blade wrote. Boy, that’s gratitude for you. “Mrs. Lucille Laskey, chairman of Sylvania Township trustees, and Sylvania Mayor Warren Schuster both complained that the multimillion dollar freeway provides no direct access to Sylvania and the township. 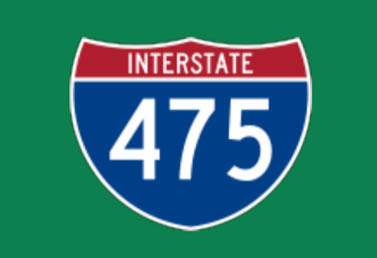 With new Interstate 475 nearing completion, I was shocked to realize that there are no exits on my way home from work after Talmadge Road and none on my way to work until you reach Talmadge. The major through street, Holland-Sylvania Road, has no entrance or exit ramps. Why? – H.W., Sylvania Township. A survey of motorists’ origin and destination and an analysis of population distribution and expected growth determined that an interchange at Holland-Sylvania was not feasible and a split interchange at Corey Road and Talmadge would serve the area, W. R. Greisiger, Ohio highway department division design and planning engineer, said. When considering traffic assignments to the various interchanges, the traffic capacity of existing street systems are considered and the major arterial routes utilized as feeder routes to the expressway, he added. In your case, Holland-Sylvania and Sylvania Avenue are considered feeder routes to I-475. With the expressway open, The Blade sent out two reporters, Tom Davies and Tom Walton, to size up their commutes. Walton, who eventually rose from covering expressway openings to be editor and vice president of The Blade before retiring, started out from Bancroft and Reynolds but found he didn’t actually save much time since he had to drive out to the Central Ave. interchange to get on Interstate 475. 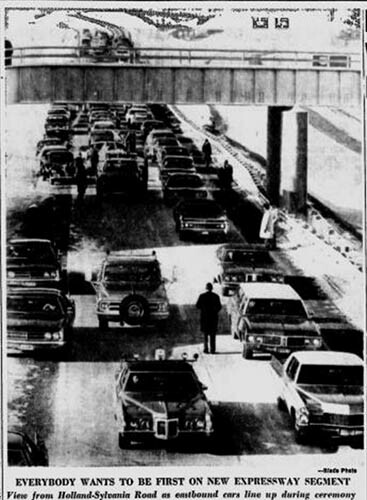 The expressway was the next-to-last link in Toledo’s expressway system. There was still one segment, from the 75/475 interchange near the former site of the Jeep plant to Interstate 280, that had yet to be built. 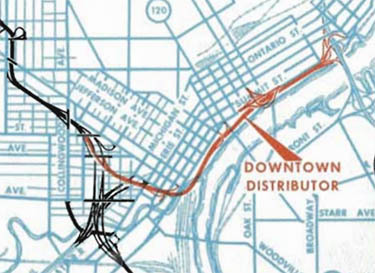 The route of the proposed, but never built, Toledo Downtown Distributor. 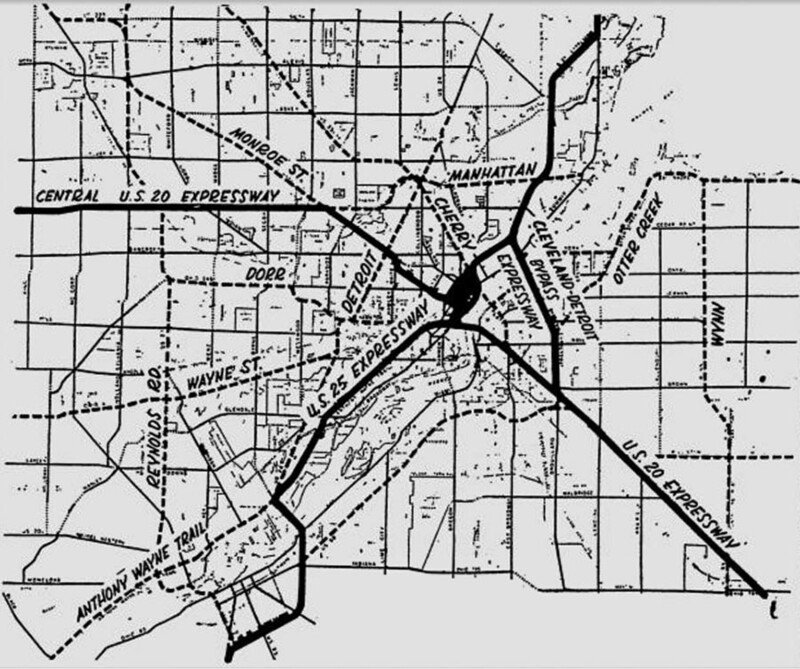 As an aside, there was a proposed, but never built, link of Toledo’s expressway system known as the Toledo Downtown Distributor. The distributor would have linked Interstate 75 with Interstate 280 and run right along the Maumee River, throwing traffic directly into downtown. I remember there used to be a “ramp to nowhere” off the Washington St. exit (202B) from southbound Interstate 75 that was intended to link to the downtown distributor, but there doesn’t seem to be any evidence of it anymore. This is the key link that will carry the heavy volume of traffic into the central business district…bogged down by indecision, changing plans, and disagreement over routes, this distributor is still a number of years away; meanwhile, thousands of drivers who will be using the expressway in the downtown area are simply going to have to move from and to it over narrow city streets that were never designed to handle the volume expected. Having lived in cities where the riverfront was cut off by an expressway, it’s my opinion they are generally abominations. Toledo should be thankful it was never built. Cincinnati is a good example: Fort Washington Way, a giant concrete trench of a highway, cut off downtown from the Ohio River. While the Maumee River has its issues, it is still a picturesque waterway (in my opinion). From a 1965 engineering feasibility report, a view of downtown Toledo with an expressway running alongside the river. The Cherry Street Bridge is in the middle. Note the great looking Tiedtke’s, lower left. Computer traffic estimates, however, were a bit off: they underestimated traffic at Talmadge Road and overestimated it at the Secor Ave. and Monroe St. interchanges. A little tweaking of traffic signal sequences and timing was expected to solve the minor issues. Ideas on how to solve Toledo’s traffic problems date from the end of the Second World War. 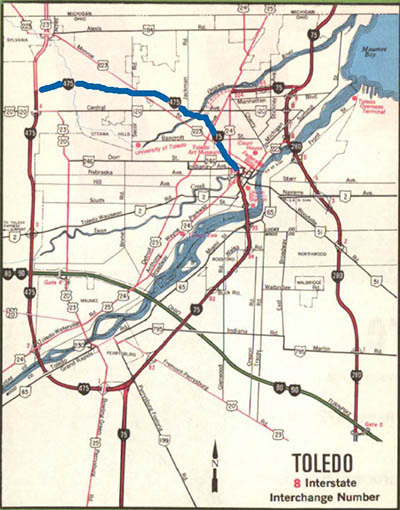 In 1949, the City-County Plan Commission revealed their plans for Toledo’s expressway system and predicted it would take fifteen years to accomplish. The map below lays out their idea, although keep in mind this was before the National Interstate and Defense Highways Act of 1956, which planned and built most of the Interstate routes we drive on today. Oddly, the first group to object to this proposal was a group of downtown businessmen: “We don’t want any inter-regional highway downtown, and no owner of downtown real estate asks or wants it downtown” was representative of the sentiment. An early idea for Toledo’s expressway system. From The Blade of May 21, 1949. Interstate 475, which has had some major improvements made to it in the last ten years – new exits, a massive rebuild, new signage – was dedicated as the Rosa Parks Highway in 1990. Cars line up to try out Interstate 475 at Holland-Sylvania Road. From The Blade of Dec. 15, 1970.